Observe the kinematics of rotational motion. Evaluate problem solving strategies for rotational kinematics. Just by using our intuition, we can begin to see how rotational quantities like and are related to one another. For example, if a motorcycle wheel has a large angular acceleration for a fairly long time, it ends up spinning rapidly and rotates through many revolutions. In more technical terms, if the wheel’s angular acceleration is large for a long period of time then the final angular velocity and angle of rotation are large. The wheel’s rotational motion is exactly analogous to the fact that the motorcycle’s large translational acceleration produces a large final velocity, and the distance traveled will also be large. where is the initial angular velocity. This last equation is a kinematic relationship among and —that is, it describes their relationship without reference to forces or masses that may affect rotation. It is also precisely analogous in form to its translational counterpart. Kinematics for rotational motion is completely analogous to translational kinematics, first presented in Chapter 2 One-Dimensional Kinematics. Kinematics is concerned with the description of motion without regard to force or mass. We will find that translational kinematic quantities, such as displacement, velocity, and acceleration have direct analogs in rotational motion. Table 2. Rotational Kinematic Equations. The equations given above in Table 2 can be used to solve any rotational or translational kinematics problem in which and are constant. Examine the situation to determine that rotational kinematics (rotational motion) is involved. Rotation must be involved, but without the need to consider forces or masses that affect the motion. Identify exactly what needs to be determined in the problem (identify the unknowns). A sketch of the situation is useful. Solve the appropriate equation or equations for the quantity to be determined (the unknown). It can be useful to think in terms of a translational analog because by now you are familiar with such motion. Substitute the known values along with their units into the appropriate equation, and obtain numerical solutions complete with units. Be sure to use units of radians for angles. Check your answer to see if it is reasonable: Does your answer make sense? A deep-sea fisherman hooks a big fish that swims away from the boat pulling the fishing line from his fishing reel. The whole system is initially at rest and the fishing line unwinds from the reel at a radius of 4.50 cm from its axis of rotation. The reel is given an angular acceleration of for 2.00 s as seen in Figure 1. (a) What is the final angular velocity of the reel? (b) At what speed is fishing line leaving the reel after 2.00 s elapses? (c) How many revolutions does the reel make? (d) How many meters of fishing line come off the reel in this time? In each part of this example, the strategy is the same as it was for solving problems in linear kinematics. In particular, known values are identified and a relationship is then sought that can be used to solve for the unknown. This example illustrates that relationships among rotational quantities are highly analogous to those among linear quantities. We also see in this example how linear and rotational quantities are connected. The answers to the questions are realistic. After unwinding for two seconds, the reel is found to spin at 220 rad/s, which is 2100 rpm. (No wonder reels sometimes make high-pitched sounds.) The amount of fishing line played out is 9.90 m, about right for when the big fish bites. Figure 1. Fishing line coming off a rotating reel moves linearly. 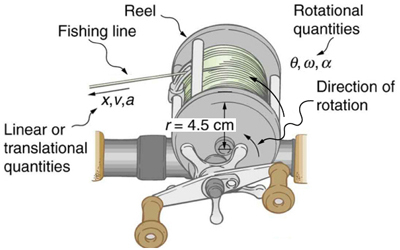 Example 1 and Example 2 consider relationships between rotational and linear quantities associated with a fishing reel. Now let us consider what happens if the fisherman applies a brake to the spinning reel, achieving an angular acceleration of How long does it take the reel to come to a stop? We are asked to find the time for the reel to come to a stop. The initial and final conditions are different from those in the previous problem, which involved the same fishing reel. Now we see that the initial angular velocity is and the final angular velocity is zero. The angular acceleration is given to be Examining the available equations, we see all quantities but t are known in making it easiest to use this equation. Note that care must be taken with the signs that indicate the directions of various quantities. Also, note that the time to stop the reel is fairly small because the acceleration is rather large. Fishing lines sometimes snap because of the accelerations involved, and fishermen often let the fish swim for a while before applying brakes on the reel. A tired fish will be slower, requiring a smaller acceleration. Large freight trains accelerate very slowly. Suppose one such train accelerates from rest, giving its 0.350-m-radius wheels an angular acceleration of After the wheels have made 200 revolutions (assume no slippage): (a) How far has the train moved down the track? (b) What are the final angular velocity of the wheels and the linear velocity of the train? The distance traveled is fairly large and the final velocity is fairly slow (just under 32 km/h). There is translational motion even for something spinning in place, as the following example illustrates. 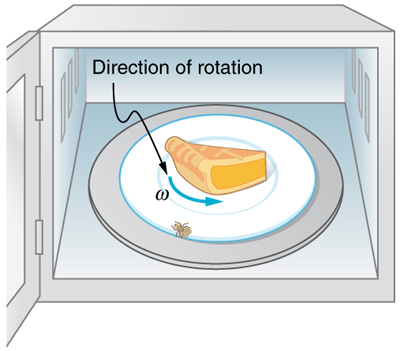 Figure 2 shows a fly on the edge of a rotating microwave oven plate. The example below calculates the total distance it travels. Figure 2. The image shows a microwave plate. The fly makes revolutions while the food is heated (along with the fly). First, find the total number of revolutions and then the linear distance traveled. can be used to find because is given to be 6.0 rpm. Quite a trip (if it survives)! Note that this distance is the total distance traveled by the fly. Displacement is actually zero for complete revolutions because they bring the fly back to its original position. The distinction between total distance traveled and displacement was first noted in Chapter 2 One-Dimensional Kinematics. The kinematics of rotational motion describes the relationships among rotation angle, angular velocity, angular acceleration, and time. Starting with the four kinematic equations we developed in the Chapter 2 One-Dimensional Kinematics, we can derive the four rotational kinematic equations (presented together with their translational counterparts) seen in Table 2. 1: With the aid of a string, a gyroscope is accelerated from rest to 32 rad/s in 0.40 s.
(a) What is its angular acceleration in rad/s2? (b) How many revolutions does it go through in the process? (a) How long does it take to come to rest? (b) How many revolutions does it make before stopping? (a) What is the angular acceleration of its 0.280-m-radius tires, assuming they do not slip on the pavement? (b) How many revolutions do the tires make before coming to rest, given their initial angular velocity is ? (c) How long does the car take to stop completely? (d) What distance does the car travel in this time? (e) What was the car’s initial velocity? (f) Do the values obtained seem reasonable, considering that this stop happens very quickly? 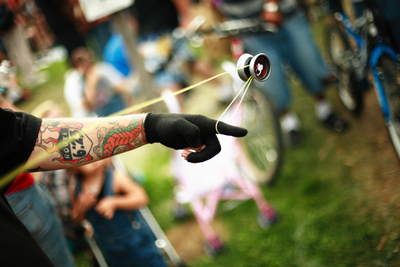 5: Everyday application: Suppose a yo-yo has a center shaft that has a 0.250 cm radius and that its string is being pulled. (a) If the string is stationary and the yo-yo accelerates away from it at a rate of what is the angular acceleration of the yo-yo? (b) What is the angular velocity after 0.750 s if it starts from rest? (c) The outside radius of the yo-yo is 3.50 cm. What is the tangential acceleration of a point on its edge? 1: Rotational kinematics (just like linear kinematics) is descriptive and does not represent laws of nature. With kinematics, we can describe many things to great precision but kinematics does not consider causes. For example, a large angular acceleration describes a very rapid change in angular velocity without any consideration of its cause. 10.2 Kinematics of Rotational Motion by OpenStax is licensed under a Creative Commons Attribution 4.0 International License, except where otherwise noted.